If we call ourselves people of faith, others may make certain assumptions about us. For example, they may assume that we observe Christmas and Easter, attend church on a regular basis, and say grace at meals. And they also may assume we never question that God hears us, answers our prayers, and has good plans for us. In Genesis 18:9-15, we read about God’s promise to Abraham and Sarah that, despite their age, they would soon have a son. But Sarah laughed in disbelief. In Matthew 14:25-33, we read about Jesus’ walking on the water to the disciples’ boat. Jesus told Peter to come to him on the water, but when Peter saw the wind, he became afraid and asked Jesus to save him from drowning. In Luke 1:18-23, we read that Zechariah didn’t believe the angel Gabriel’s message that he and his wife, Elizabeth, would have a child in their old age. In Matthew 9:18-19, 23-26, we read about a ruler who believed that Jesus could restore his daughter to life with a touch, and Jesus did so. And in Hebrews 11, we read about more faith-filled people. As the Catechism tells us, faith “is an entirely free gift that God makes to man” (s. 162) and gives us a foretaste of heaven (s. 163), and a greater knowledge of God and his works will increase our faith (s. 158). If we struggle to trust in the plans God has for us, I pray that we would remember we aren’t alone in this, that we would be encouraged by the example of the faithful people who have gone before us, and that we would pray to God to increase our faith day by day. This past weekend, after weeks of preparation, my parish church got a thorough cleaning. And I got a lesson in trust. 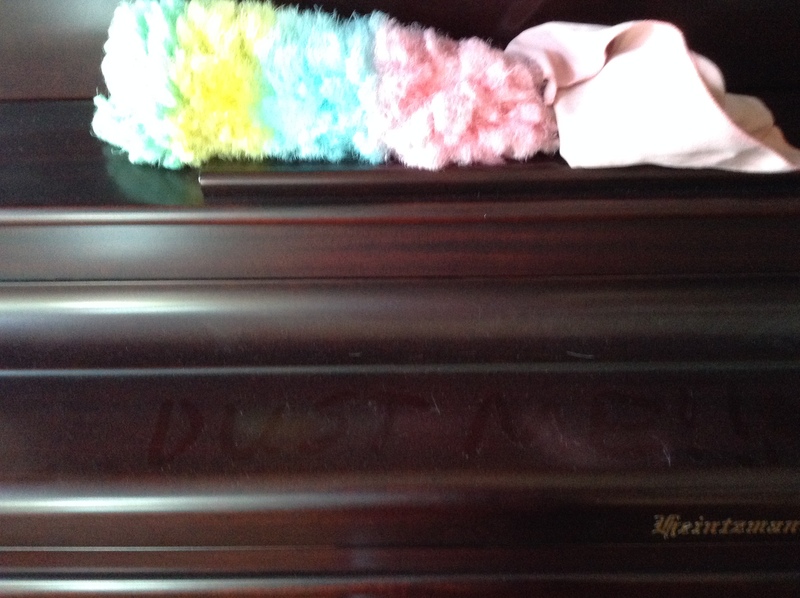 I mentioned in an April post that some parishioners had noticed cobwebs and dust that needed taking care of—and that led us to wonder what else needed doing. I asked my husband to bring this to our Pastoral Council, and the Council approved a clean-up day. Which I ended up organizing and preparing for. Secretly, I’m sure my husband and my son were grateful I wasn’t organizing and preparing for a clean-up of our garage or basement storage areas. In any case, I thought I had things under control. I e-mailed lots of people about cleaning out closets in the parish hall. I put notices in the announcements and in the bulletin for several weeks and posted sign-up sheets. The closets didn’t get cleaned out. Only seven people signed up to help. And then two of those people couldn’t come owing to other commitments. I spent weeks stressed out, making repeated trips to the church to sort, purge and clean, and I wondered how I’d get everything done. At the same time, I was stressed out by being on the receiving end of some harsh e-mails about a church project. I should have known better and had a little faith in God’s timing and plans. Because, in the end, it did all come together. On Saturday morning, I arrived at the church early to set up. I realized that just clearing up some of the storage spaces in the parish hall made the clean-up a success. But I still wondered how many people would show up. Thanks to my husband’s update on the project to Pastoral Council and an e-mail sent by a parishioner who supported me throughout the process, I found myself with nine helpers. And together, we accomplished more than I could have hoped. In just five hours, we demolished dust bunny colonies in nooks and crannies of the church, vacuumed rugs, washed floors, polished pews, and changed light bulbs. Second, I should have leaned on God and prayed more for his help instead of trying to make it all happen in my own strength. The LORD is on my side to help me. . . .
May we remember to pray that our plans line up with God’s plans, to ask him to meet our needs, and to lean on him before stress gets the better of us. Though the power of Omnipotence had been his to wield at that moment, he had too much of its diviner property of Mercy in his breast, to have turned one feather’s weight of it against her. With the events of Holy Week still fresh in our minds, God’s love for and mercy toward us should be as plain as day. But as the Redemptorist priest speaking at my parish’s mission said, people may go to confession and receive absolution from a priest and yet find it hard to believe God could actually forgive them. Since this will be the first Sunday after Easter, Catholics will mark Divine Mercy Sunday. If you are new to the Catholic Church, you can learn more by reading Divine Mercy in My Soul: Diary of Saint Maria Faustina Kowalska and visiting The Divine Mercy Message from the Marians of the Immaculate Conception website. We need to grasp that truth: our sins may be great, but God’s mercy is greater. We can place our trust in God, who has told us (see Exodus 34:6) and shown us that he is merciful. And we in turn can show that mercy to others.